This is a place of falcon nests and memories. Jimi Yamaichi stands in front of Castle Rock, known to locals as The Peninsula. He shares the history of the cross at the top of Castle Rock. Each Tule Lake Pilgrimage offers an opportunity to climb Castle Rock and at the summit behold a 360 degree view of the Tule Lake Basin. This is a place of memories and falcon nests. 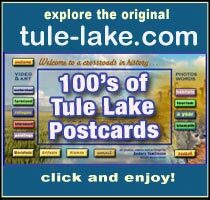 The Peninsula is manage by Tule Lake National Wildlife Refuge. Hearses would come in and out of camp three times. A person in the camp made money selling what was the best starter for sake. 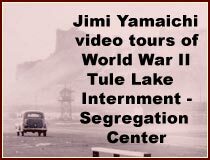 This scene ends with Jimi Yamaichi, standing on the site ofTule Lake Internment – Segregation Center, saying, ” an example of the ingenuity of people living in harsh conditions.” He is speaking of the sake stills that were throughout the camp and the means to hide them from the guards. He mentions a hole in the floor of a 1942 barracks, to the northwest, at the Tulelake – Butte Valley Fairgrounds and Museum. He also notes that a person in the camp made money selling what was the best starter for sake made from rice purchased at a camp store. The mess halls fired their boilers up at 4am. Jimi Yamaichi shows us the remains of a coal pile that fed a laundry room’s boiler. He also points out laundry room remnants. Each block had a coal pile that served 17 to 18 barracks. The mess halls fired their boilers up at 4am. Breakfast was served between 6 and 8am. Lunch was served between 11:30am and 1:30pm. Dinner was served between 6 and 7:30pm.